Orphan, clock keeper, thief: Hugo lives in the walls of a busy Paris train station, where his survival depends on secrets and anonymity. 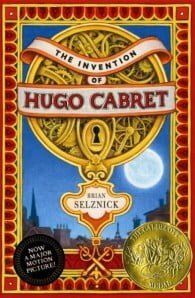 Combining elements of picture book, graphic novel, and film, Caldecott Honor artist Selznick breaks open the novel form to create an entirely new reading experience in this intricate, tender, and spellbinding mystery. Brian Selznick is the Caldecott award-winning author and illustrator of The New York Times bestsellers The Invention of Hugo Cabret and Wonderstruck. He is also the illustrator of many celebrated picture books and novels, among them Caldecott Honor Winner The Dinosaurs of Waterhouse Hawkins by Barbara Kerley, andSibert Honor Winner When Marian Sang by Pam Muñoz Ryan. Brian has previously worked as a set designer and a puppeteer. He lives in San Diego, CA, and Brooklyn, NY.